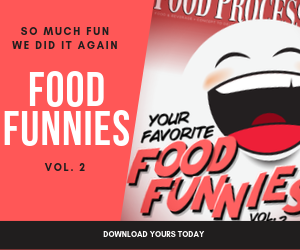 Food Processing's monthly spot of humor, Food Funnies, featuring drawings by award-winning cartoonist Jerry King. Click on each image below to see the cartoon as well as the captions submitted for that cartoon. Enjoy! Join in on the fun by submitting a caption for August's Food Funny cartoon caption contest. See what we've hatched for October by coming up with a clever caption for our cartoon. Fall back into fun with this light-hearted cartoon caption contest.